If you thought that you have seen enough food trends in your life, then wait till you know about this one. The latest in the trend is Yuu Japanes Tapas, a Japanese restaurant in British Columbia, Canada that serves Beer Ramen. Yes, you heard us! 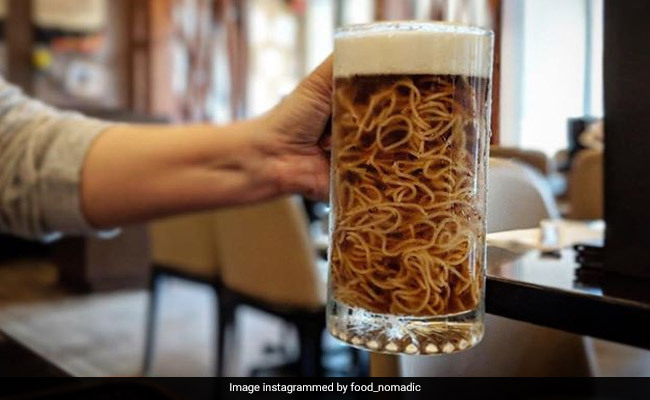 If you are a beer lover and do not welcome the idea of ramen being dunked in your favourite summer beverage, or if you are obsessed with ramen and do not want anyone to mess with the drink, don’t worry the ‘beer’ in the Beer Ramen only resembles the beverage, but is actually not. Don’t believe us? Well, the meal only looks like beer and has nothing to do with alcohol. Here’s what you need to know about this new trend. Beer Ramen is a meal that’s served in a stein and does not contain alcohol. The chilled broth, which clearly looks like beer, is prepared from bonito flakes and the top foam is made with egg whites and gelatine, which have been whipped into foam to look like the froth on top of beer. So, what you thought was ramen dunked in beer is actually nothing but broth and noodles. Ramen is a Japanese dish, made with Chinese style noodles. These are generally served with a meat or fish-based broth, mostly flavoured with soy sauce or miso and topped with sliced pork, dried seaweed or green onions. The Beer Ramen is served cold and is a summer special delicacy served in the restaurant and comes with veggie tempura. If this delicacy doesn’t appeal you, the restaurant also serves hot ramen in bowls. Source: Beer Ramen: Would You Try This Unusual Food Trend?